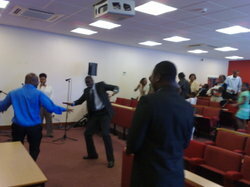 There is a little bit of Africa to be encountered at Caledonian University every Sunday morning at 11am. I visited Glasgow International Christian Church today as the guest preacher. Exuberant singing and dancing featured heavily. This Scot complied by clapping and dancing in very poor time. Prayer for exams, for birthdays and the nation were offered. The service lasted about two hours (and this was without communion but with a short-ish sermon from yours truly), and was followed by a sumptuous lunch. I was given an effusive welcome and introduction (embarrassing in its praise), and when I spoke I listed the African countries I've visited. Those from the mentioned countries cheered, but it was the Nigerians who shouted loudest. I think Nigerians are a little like the Scots - very proud of their nation, and very vocal about their presence when in a foreign land. I wonder if they have an equivalent of the kilt and 'see-you jimmy hat'? There were folk from other nations present too, including a man with a powerful story of conversion from Hinduism. There were even some Scots. It was a joy to take part, though I'm sure they are used to a rather more passionate brand of preaching than they got this morning. I think there is a real work to be done among people from overseas, which Lukas Njenga and his team have tapped into.